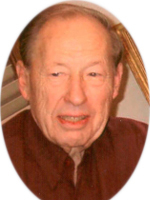 GUILDERLAND – John E. Kinisky (Jack) of Guilderland died on Wednesday, March 22, 2017, after a long illness. Born in Troy on August 27, 1927 he was the son of Dorothy M. Baker and James P. Kinisky. He lived his early years in Rensselaer and attended St. John’s Catholic High School. He joined the US Navy after graduation and served in World War II aboard the USS Brinkley Bass. Upon completing his tour of duty he enrolled in Siena College and graduated with a degree in Business Administration. Jack established his public accounting firm in 1958 and continued until his retirement in 1990. He was a past member of the National Association of Public Accountants, he was a member of the Siena College Alumni Association, and past member of Aurania Club. He enjoyed being a member at Pine Haven Country Club where he frequently played golf with his closest friends. In his retirement years he bowled with the Senior Citizens bowling team at Hoffman’s Sunset Lanes. Jack was a life member of the Knights of Columbus – Council #173 and past member of the American Legion, Fort Crailo Post in Rensselaer. He was a spirited fan and season ticket holder for the Siena basketball team. He was also a passionate fan of the Notre Dame football and St Louis Cardinals baseball team. He was the biggest fan and proudest grandfather for all of his grandchildren, attending swim meets, soccer, football, baseball and basketball games. Jack and Alice enjoyed vacationing with their children and grandchildren. Many wonderful memories in Cape Cod, Maryland and Maine. He and Alice loved traveling, going to Florida and cruising with their friends from California. Jack had a great sense of humor, he was kind and a very generous man. He was happiest at family gatherings, birthday celebrations. Thanksgiving and Christmas where there was an overflow of laughter, joy and love. He is survived by his family who loved him endlessly, his wife Alice of 62 years and their three children, Marianne Belles(Michael) of Schenectady, Thomas (Catherine) of West Palm Beach, FL, and Jeanne Bender (Ronald) of Guilderland; and five grandchildren John and Mark Belles and Joseph, Megan and Matthew Bender. A brother, Robert (Sandy) of Lockport, NY, and a sister Anna May Peek of Hellerton, PA; and several nieces and nephews. He was a communicant of Christ the King Parish, Westmere. A Mass of Christian Burial will be celebrated in Christ the King Church, Saturday morning at 9:00 a.m. Relatives and friends are invited. There will be no calling hours. Interment will be in Our Lady Help of Christians Cemetery, Glenmont. Contributions in Jack’s memory may be made to the Christ the King Building Fund, 20 Sumpter Ave., Albany, NY 12203. To leave a message of condolence for the family, please visit www.HansFuneralHome.com. I was very blessed to have Jack as my brother. As I am handicapped, I am unable to say goodbye in person. May gods Grace and Love Shine on you Alice and your family. We share in your loss. We will agian in the domain of Heaven.